The North American Telugu Association (NATA) is preparing for its 2014 biennial convention, to be held at the Georgia World Congress Center in Atlanta on July 4-6, 2014. Over 10,000 people of Telugu origin are expected to attend, and the conference will be transmitted live through many TV channels to millions across USA, Canada and India. Arrangements are in full swing with over 200 groups of volunteers across USA, Canada, and India. Part of the preparation is an outreach program to spread the word on NATA’s mission of promoting community services, cultural and social activities, and preservation and promotion of Telugu language and heritage. The NATA Nagara team from Atlanta held a whirlwind tour covering the cities of Huntsville, Nashville, Memphis, Atlanta, Charlotte, and Birmingham over two weekends in August. At each city, the night came alive with melodious songs, pulsating rhythms, and enthralling entertainment. Celebrity guests, Tollywood lyricist Shri Chandra Bose and Telugu singing sensation Shri Mallikarjun, participated. Their talent and fame notwithstanding, both celebrities wowed with their humble attitude and their readiness to join with the crowds. Shri Chandra Bose tugged many a heart by sharing his narrative on how he was inspired to pen his blockbuster songs, including “Panchadaara Bomma.” This added a human dimension to the celebrations. 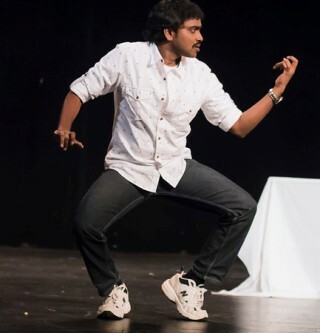 Shri Mallikharjun kept the crowd on its feet by imitating the superb dancing styles of superstars Chiranjeevi, NTR, ANR, Krishna, etc., while effortlessly singing the latest chartbusters with gusto. Each performance was received with enthusiasm, so it was no wonder to see a fruitful membership drive at each venue, following this pleasant camaraderie. NATA's Dr. Prem Reddy and Dr. Malla Reddy were the grand sponsors for the NATA Nagara efforts. NATA leaders' vision of community service and Telugu culture is being met in communities across the USA. NATA President Dr. Sanjeeva Reddy, along with NATA 2014 Convener Bala Indurti announced that Shri Chandra Bose will be the Brand Ambassador for NATA. Shri Mallikarjun was given the title of “Nava Yuva Balasubrahmanyam” for his exemplary singing and entertaining skills, and the title of “Swabhava Kavi” was conferred on Shri Chandra Bose. Nikki Gella, left, Runner Up, Atlanta NATA Nagara night. Archana Reddy, right, 2nd Runner Up. Admitting that it was an arduous task, given the talent and flair of all the participants, the soft spoken Swabhava Kavi announced Meghana Pothukuchi as winner (see photo at top), Nikki Gella as runner-up, and Archana Reddy as 2nd runner-up for the Atlanta NATA Nagara night. Participants in other cities received medals. The NATA Nagara team from Atlanta. Birmingham (Sudheer Amireddy, Sathish Vadlakonda, Apparao Mantha, Ram Gorre, Kishore Dasari, Subbu Bodem, Vishnu Thogaripalli). Logistics: Dr. Sanjeeva Reddy, Bala Indurti, Ravi Kandimalla, Srini Vangimalla, Satyamarayana Reddy, Goutham Goli, Ramesh Chaparala. Lunches and dinners for Chandra Bose and Mallikharjun: Bala Indurti, Kiran Kanduala, Sharad Jhadav, Jagadeesh Cheemarla, Gireesh Meka, Venkat Mondeddu, Rambabu Potturi, Raghu, Srini Vangimalla. Promotion: TAMA, GATA and Amritavarshini. Super Singer Program: Venkat Chennubhotla, Ram Durvasula, Neelima Gaddamanugu, Bhanusri Vavilikolanu, Keerthana Chennubhotla, Teja Chennubhotla. President Dr. Sanjeeva Reddy for traveling with us on NATA Nagara. EVP Dr. Haranath Policherla for joining the NATA Nagara for 2nd week. Dr. Vijaya Appareddy and Sri Ramesh Appareddy for joining NATA Nagara 2nd weekend.